The street was located at the very edge of the ghetto, a few steps away from its western border. Beginning in September 1940, the Jewish public prosecutor's office, the court and the Investigation Office of the Order Service were located in the buildings at 20 and 22 Gnieznienska Street. Their task was to fight crime in the ghetto, most notably corruption and other abuses involving people of authority. Rumkowski set up the court and the public prosecutor's office a few months after the ghetto had been sealed off from the rest of the city. This judicial system nabbed department directors, kitchen managers and other managerial people. Petty fraud and theft were also targeted. The sentences were severe. Those convicted were punished with prison terms and hard work. Many were sent to work outside of the ghetto. The prisoners were included in the first group deported to the death camp at Chelmno-nad-Nerem in January 1942 [see: The_Central_Prison]. The ghetto criminal justice system had civil and penal codes to follow. There were, of course, judges, prosecutors and defence attorneys. In 1941, the Summary Court, which handed down sentences without prosecutors or defense attorneys, began to function at 27 Franciszkanska St. Its decisions were irrevocable. It was located at 27 Franciszkanska Street. After its destruction, Rumkowski, along with his closest cohorts, began to try and punish those suspected of criminal activity. Some ghetto researchers say that handing down sentences was a form of pressure and repression Rumkowski used against ghetto Jews who challenged him. It's been reported that Rumkowski was given the authorization to take over cases concerning illegal currency trade, homicide and the spread of information harmful to the Third Reich, which had been under the jurisdiction of the German courts. The Jewish judges were then reportedly going to have the authority to hand down death sentences. But this never materialized. Pharmacy No.2 was also located at 20 Gnieznienska Street. During the first months of the ghetto, beginning in April 1940, a care home for the elderly functioned in the tenement building at 26 Gnieznienska St. In the autumn of 1941, the Home for the Aged was established in the same building for the Jews deported from outside Poland. Everyone living there was sent to Chelmno-nad-Nerem and killed during the so-called "shpera" in September 1942. The desolate building was to house a new labor department, but eventually a rest house for workers opened here. The ghetto inhabitants were rewarded a one-week leave at this site after long months of hard work. For many of them, it was a hope for survival. During such a leave, they would receive full meals, which could build up their strength. Tragically, for many of them this chance came too late. The buildings on Gnieznienska Street are still standing. The Court supervised by the Eldest of the Jews was conducting a case involving a policeman and a janitor, accused of stealing the wood entrusted to them. The janitor was punished with five months in prison, the policeman with four months of prison with hard labor. The Chronicle of the Lodz Ghetto, January 20, 1941, Vol. 1, p. 23. After a long and painstaking investigation, the local Investigation Office managed to stop a dangerous ring of thieves, who specialized in stealing flour from bakeries. The ring operated with impunity for a long time, having its secret collaborators among the bakers and even bakery supervisors. Two members of the Order Service were involved, too. [...] The Investigation Office traced the thieves thanks to the strict surveillance of the Order Service member, whose life beyond his means was suspicious since long ago. The Chronicle of the Lodz Ghetto, July 5-12, 1941, Vol. 1, p. 194. 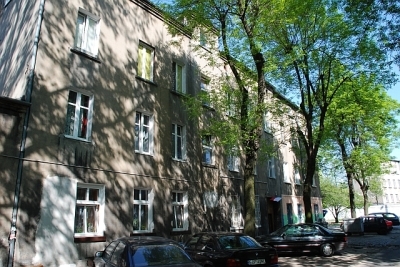 A Home for the Aged, designed especially for the newly-arrived deportees, was opened on Gnieznienska Street almost at the same time when the new arrivals settled in the ghetto. A conference concerning the enlargement of this institution was held on November 28 at the Statistics Department premises. The Chronicle of the Lodz Ghetto, November 1941, Vol. 1, p.277. Today a new, extremely important public institution opened. It is the Home for the Aged, assigned for the newly-arrived people. Taking into consideration the abnormally large percentage of elderly people among the new residents of the ghetto, the opening of a special shelter is a solution to one of the most urgent needs, which resulted from the increase of the ghetto population by more than 20,000 people. The Chronicle of the Lodz Ghetto, December 1, 1941, Vol. 1, p.285. 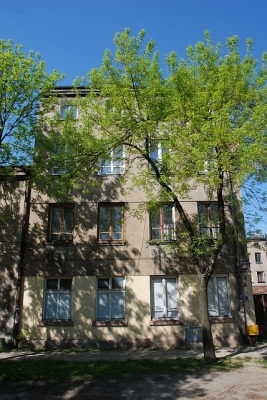 Yesterday the Leave Committee, according to current practice, sent the first group of workers for their entitled week leave, to the new rest house on Gnieznienska Street (the former Home for the Aged building). As the new house can accomodate 150 people (the first rest house in the ghetto could only accomodate 26), the workers groups will change more often. Now we already have four rest houses: three in Marysin and the fourth, the new one, on Gnieznienska Street. The Chronicle of the Lodz Ghetto, November 3, 1942, Vol. 2, p.341.